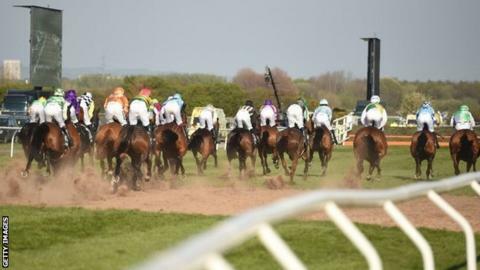 Twenty six jockeys have each been given a one-day ban after a false start delayed this year's Grand National. The riders, including Derek Fox, who rode winner One For Arthur, accepted they did not properly follow the starter's instructions. They will serve their suspension on various dates later in May. Aintree stewards referred 31 of the 40 jockeys in the 8 April contest to the British Horseracing Authority (BHA), but five were cleared. A disciplinary panel ruling said: "As the runners moved to the start, the starter asked them to take a turn in order for delayed runners to join the group. Although the jockeys did eventually take a turn, they did not do so immediately when requested." The inquiry has been less controversial than three years ago, when jockeys initially refused to co-operate when a hearing was scheduled for later on Grand National day. On that occasion, assistant starter Simon McNeill was knocked over by one of the runners as it approached the start line. He was not badly hurt, and cautions were eventually issued to 39 jockeys at a rescheduled hearing. After Friday's hearing, a BHA spokesman said: "Starting the Grand National presents a unique challenge for both starters and jockeys, as does holding an inquiry with a large number of jockeys immediately after the race. "This is why the inquiry was held back until today and we are grateful for the co-operation of the jockeys in this process." The Professional Jockeys' Association says it will continue to talk to the BHA about improving issues around the start of the National.